Russia to continue its support for Damascus, despite U.S. accusations. The second day of the G20 summit in St. Petersburg finally brought the Syrian issue to attention, as deep divisions among the worlds’ leading economies became even more evident. Russian President Vladimir Putin said at the press conference on Friday, Sept. 6, that Russia will continue cooperation with Syria, even in the case of a military attack against the Arab country. The Russian president reiterated his stance that a military intervention against a sovereign state can only be carried out if the attack is a matter of self-defense, or if it is authorized by the U.N. Security Council. “It’s known that Syria is not going to attack the United States,” Putin said, adding that Washington placed itself above the law with its military plans. 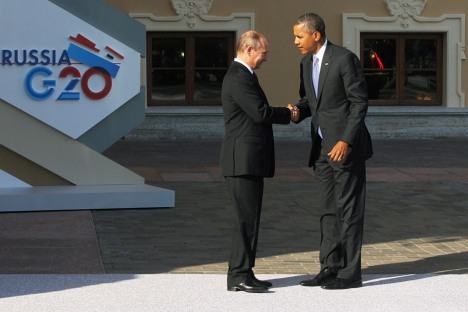 Putin revealed that he met U.S. President Barack Obama on the sidelines of the summit on Friday. “Each of us sticks to our opinion. But there is dialogue between us: We hear each other, understand each other’s arguments. I don’t agree with his arguments, he doesn’t agree with mine. But we hear, we try to analyze,” Putin said. According to Putin, among the G20 states that support a military attack against Syria are the United States, Turkey, Saudi Arabia, Canada and France. Most of Obama’s speech at his own briefing was devoted to Syria. According to Obama, leaders of the G20 agreed that a chemical weapon was used in Syria and its use is unacceptable. The U.S. president gave excessive justification for his tough stance. He stressed that the Syrian regime is a threat to the world and to its immediate neighbors, and, unless the United States gives a strong response, all authoritarian regimes will decide that they can use chemical weapons and remain unpunished. Obama stressed that he would prefer to solve the issue through multinational channels and the U.N., but the international community is currently paralyzed. He hinted that the Security Council is used now not to strengthen international law but as a barrier for such actions. According to him, it is time for the U.S. to make a hard choice. To support his idea, the U.S. president several times brought up the genocide in Rwanda, which happened because of inaction on behalf of the international community. The use of chemical weapons against people and children is unacceptable, and the U.S. will stand by this principle, said Obama. Yet there are some positive signs that Russia and the U.S. could reach an understanding on Syria. Obama said that, during his conversation with Putin, they agreed that the crisis must be resolved through political transition as it is laid out in the Geneva plan. However, Moscow and Washington disagree about the details. Despite his determined attitude, Obama several times mentioned that the proposed military response will be limited (both in length and strength) and proportionate. Its main goal is to convince Assad that he cannot use chemical weapons. “Not Iraq—not putting boots on the ground,” Obama said. Asked about the possibility of new chemical attacks even after the U.S. strike, Obama said that, if Assad remains undeterred and goes on with the chemicals, then it will be much easier to gain international and U.N. support for harsher measures against the regime. French president Francois Hollande spoke almost the same language with Obama: France had earlier said that it would join a U.S.-led military operation if the U.S. Congress approved the intervention. Hollande confirmed that Paris would not attack unless Syrian leader Bashar Assad’s role in the recent chemical attack was proven by U.N. experts. The French president also said Paris would strengthen support to the oppositional National Syrian Coalition. “It’s not about deciding who would interfere, it’s about who wants peace,” Hollande said. The French leader stressed thatthe recent chemical attack in Syria may encourage other dictators to align with Assad. “It would reach a level where our own security would be under the threat,” said Hollande. Britain, whose parliament voted last week against a possible U.K. military action in Syria, will not be part of any military action, British Prime Minister David Cameron said at the G20 press conference on Friday. “I understand and respect what the U.K. parliament has said. Britain will not be part of any military action,” said Cameron. Cameron said he organized a meeting on Friday morning in St.Petersburg with the U.N. Secretary General, the EU, Japan, Turkey, Canada, France, Australia, Saudi Arabia, Italy and America. The participants agreed to work together through the U.N. to secure humanitarian access inside Syria, including securing priority humanitarian routes to ensure the aid convoys can get through to the sieged areas, and lifting bureaucratic obstacles like customs rules that make it hard to deliver aid. The British leader also announced that the U.K. would allocate an additional £52 million ($81.2 million) to Syria, while Canada and Italy would pledge $45 million and $50 million, respectively.